Disability, Space, Architecture: A Reader takes a groundbreaking approach to exploring the interconnections between disability, architecture and cities. The contributions come from architecture, geography, anthropology, health studies, English language and literature, rhetoric and composition, art history, disability studies and disability arts and cover personal, theoretical and innovative ideas and work. Richer approaches to disability – beyond regulation and design guidance – remain fragmented and difficult to find for architectural and built environment students, educators and professionals. By bringing together in one place some seminal texts and projects, as well as newly commissioned writings, readers can engage with disability in unexpected and exciting ways that can vibrantly inform their understandings of architecture and urban design. Most crucially, Disability, Space, Architecture: A Reader opens up not just disability but also ability – dis/ability – as a means of refusing the normalisation of only particular kinds of bodies in the design of built space. 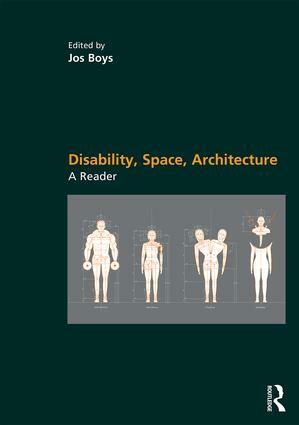 It reveals how our everyday social attitudes and practices about people, objects and spaces can be better understood through the lens of disability, and it suggests how thinking differently about dis/ability can enable innovative and new kinds of critical and creative architectural and urban design education and practice. Where does the person end and the technology begin?